Mirror, Mirror on the Wall, Which Country Has the Most Expensive Bureaucrats of All? I’ve complained endlessly about America’s bloated and expensive government bureaucracies. It irks me that people in the productive sector get slammed with ever-higher taxes in part to support a bunch of paper pushers, regulators, cronies, busy bodies, hacks, and others who have climbed on the gravy train of public sector employment. It even bothers me that bureaucrats put in fewer hours on the job than private-sector workers, even though I realize the economy probably does better when government employees are lazy (after all, we probably don’t want hard-working OSHA inspectors, Fannie and Freddie regulators, and IRS bureaucrats). But sometimes it helps to realize that things could be worse. And based on some international data from my “friends” at the OECD, let’s be thankful the United States isn’t Denmark. That’s because nearly 20 percent of Denmark’s economic output is diverted to pay the salaries and benefits of bureaucrats, compared to “only” about 11 percent of GDP in the United States. Not only are bureaucrats nearly twice as expensive in Denmark as in the United States, they’re also much more expensive in Denmark than in other Nordic nations. Speaking of Nordic nations, they tend to get bad scores because a very large share of their populations are sucking at the government employment teat. Whether we’re looking at the total cost of the bureaucracy or the number of bureaucrats, the United States is a middle-of-the-pack country. But I am somewhat surprised by some of the other results. Germany is significantly better than the United States, whether measured by the cost of the bureaucracy or the size of the bureaucracy. Japan also does much better than America, notwithstanding that nation’s other problems. In the I’m-not-surprised category, France does poorly and Switzerland does well. 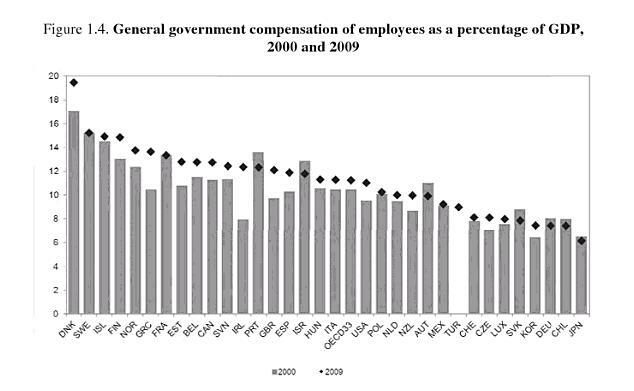 To see where bureaucrats are most overpaid, look at the nations (particularly Greece, but also Portugal and Spain) where overall pay is a very large burden but bureaucrats are not a big share of the workforce. P.S. 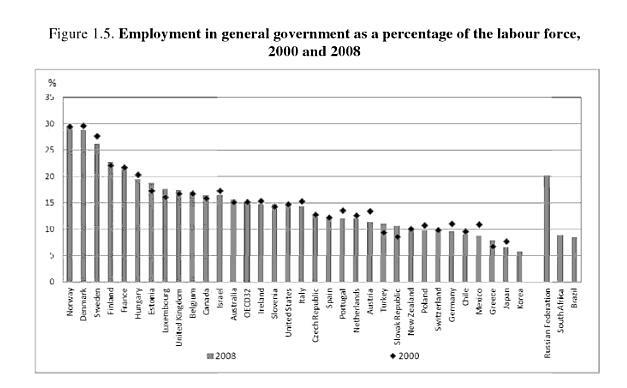 These numbers are only for OECD nations, so it’s quite possible that other jurisdictions are worse. To cite just one example, I was one of the researchers for the Miller-Shaw Commission, which discovered that fiscal problems in the Cayman Islands are almost entirely a function of too many bureaucrats with too much compensation. P.P.S. Here’s my video on the cost of bureaucracy in the United States. P.P.P.S. Denmark has a bloated and costly bureaucracy, but it compensates by having very pro-market policies in areas other than fiscal policy. P.P.P.P.S. Perhaps the numbers are bad in Denmark because people like Robert Nielson are listed on government payrolls as independent leisure consultants? on March 22, 2016 at 7:52 am Mirror, Mirror on the Wall, Which Country Has the Most Expensive Bureaucrats of All? on April 19, 2015 at 5:25 pm Nešto je trulo u državi Danskoj | Tko je John Galt? 30% of the population working for the government! How long before there are more government employees than private sector workers, and it’s impossible to vote them out because they’re the majority? Have a look at Singapore’s petty dictatorship, run like a Mafia Family,where the Lee Family and its Made Men and its wholly owned Consigliere (AKA the judiciary) are paid Millions. And where, because almost every one of them is older than the city-state’s mandatory retirement age (55 last time I checked) the double whammy for Singapore’s serfs and vassals is that every one of them also qualifies for and receives a full pension – of Millions. As important for them all of them but especially important concerning those of them who are “judges,” folks past retirement age serve only at the pleasure of the “government.” Which convenience has seen to the effect that no one who has ever sued and/or has been sued by any of the petty dictatorship-by-any-other-name and/or its cohorts and cronies, has ever won. Or should I say has ever not lost! Govt employees (Federal, state & local) comprise the vast majority of what I term, “The parasitical-political class”. They are, by far, the ones that drive politicians to do their dirty little deeds. Yet despite advances in understanding the problems of a bloated and ever-growing federal government, it’s sad to say that the average private sector worker still doesn’t get it. Their public education along with the lamestream media news has done its job well to keep these uniformed slaves dumbed down. Thus, the proletariat still don’t understand the gravity of the “public servant” problem. This, I submit, might be the number-one issue regarding government that honest & moral people need to learn about. The time has come to shine some sunlight. So what can be said about government employees that hasn’t already been said. They are the basic root of all government evil. This one group of individuals by itself is crushing our fragile semi-capitalist market economy. It’s only about 95% that are lazy, incompetent, stupid, uncaring, boring, immoral, arrogant, & selfish. And to think they give a bad name to the whole lot. Now if the neurotic behavior of these public serpents were the worst of our problems, we could easily adapt. But I assure you (as if you didn’t know already) these deficient personalities are the least of our problems. Here’s the rub: as Dan has stated many times before, they just happen to be financially compensated on average twice as much in salary & benefits compared to the person doing the same work in the private sector. But wait, it gets even better. The real kicker is that these mentally deficient freeloaders just happen to be politically active. And I mean very politically active. That means they contribute money, big money — earned on the backs of the taxpaying public — to the biggest government spenders they can find. And as a consequence of their actions, this is where we find ourselves today – locked into perpetual BIG GOVERNMENT that just grows larger and larger. And now that they control 50+ percent of the voting public we are eternally locked into never ending statism. So let’s all be honest with each other, hold hands, and say it together: “All government employees are parasites on the private sector”. There, now that wasn’t so bad was it? If you agree then you can logically conclude that the number one goal of all government agencies, and therefore all government employees, is to perpetuate and grow the system. I’ve read that for every tax dollar sent to Wash D.C., 70% is eaten up by bureaucrats. That might give us a clue as to who’s actually draining the Treasury. And with a clique of 20+ million politically active blood-sucking members who vote lock-step with their parasitic brethren, do you think a group like that could possibly sway an election? I could go on but I think you have the idea. These life-draining deadbeats must be stopped, or else. If the blinded masses don’t do something to stop their cancer-like proliferation, and seriously cut back on these freeloaders before long, kiss our freedoms goodbye, forever.